Are you suffering from High Blood Pressure, High Cholesterol, Inflammation, or Heart Disease? It is important for all of us to have a strong and healthy heart. Our heart is our life source, and its beat keeps us dancing to the rhythm of life! Did you know that your heart beats 100,000 times a day? That means it has to be pretty strong! But sadly many Americans don't have a healthy heart. Heart disease is the leading cause of death in America! 75 million Americans suffer from Heart Disease and each year 610,000 Americans die from this condition- that's 1 in every 4 deaths! The good news is that there is a lot you can do to improve your cardiovascular health! 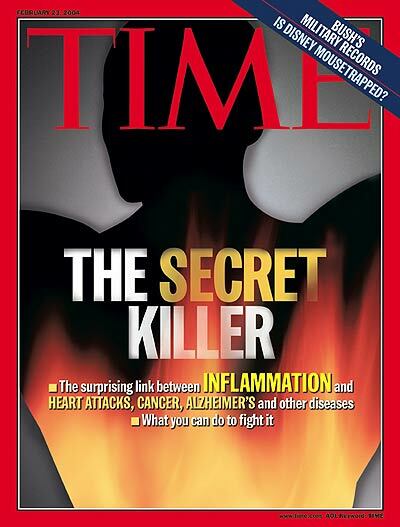 Check out what TIME MAGAZINE has to say about inflammation! The most important issue to pay attention to is inflammation. Inflammation is the number one concern for your overall health and the real cause of heart disease. It is inflammation that causes cholesterol to be trapped in the arteries, and without this inflammation of the artery walls, cholesterol would move freely through the body as nature intended. Inflammation is the body's natural response to foreign invaders such as bacteria, viruses, toxins, and unnatural or harmful foods. When exposed to these, the body's cycle of inflammation helps to protect us from them; however, with constant exposure, our body suffers from chronic inflammation. If you experience pain, fatigue, high blood pressure, or digestive disturbances there is a good chance that inflammation is playing a role. It is important to look closely at these red flags because chronic inflammation eventually leads to greater health concerns including Cardiovascular Disease, Diabetes, Alzheimer's, Arthritis, Cancer, Autoimmune Disease, and Neurological Disease. We should all be aware of our risk for heart challenges, heart disease, and heart attack. Through integrative medicine, we tend to the risk factors of heart disease to make sure the heart is healthy and strong. We can help you find out what risk factors may be present, the underlying causes of heart problems, and the role inflammation is playing in your heart health. The Holman Omega-3 Test- A quick and easy finger prick test to determine your inflammation levels and immune health. Once your receive your results, we will help you decipher what is causing any inflammation found on the test and what can be done to decrease it. ABI- The Ankle Brachial Index - this test measures the blood pressure at the ankle and in the arm to create a ratio between the two. It is used to check for peripheral arterial disease and to access risk of heart attack and stroke. We combine biochemistry evaluations, allergy and food intolerance testing, nutritional counseling, supplement protocols, and detoxification programs to guide you in the process of improvement. Through a blood chemistry analysis, you will be able to watch your inflammatory markers - C reactive protein, homocysteine, and ferritin levels- decrease as you begin a strategy of lifestyle modification, dietary changes, exercise and supplementation. You can walk the road towards a healthier and healthier you! Lifestyle Changes to decrease inflammation, lower your cardiac risk, and improve your overall health! Maintain a diet full of fruits and vegetables, and make sure to get enough Zinc, Potassium, Magnesium, Vitamin B, Vitamin C, Vitamin D, Vitamin E, and Vitamin K2 . As you think through the steps you want to take towards greater cardiac and overall health for you and your loved ones, keep this in mind: a good, belly laugh improves heart health by increasing your blood flow by 20% as the lining of your blood vessel walls relaxes and expands. So keep laughing! Reduce your cardiac risk and enjoy a healthier life!